Sunday was bitterly cold in London, which prompted me to think about winter time accessories. It is often the case that you fail to appreciate those things which are common place to you. Therefore, I suspect that those readers from the US of A (which is the majority of you good folk) may not fully appreciate my long running obsession with the Rancher Glove. 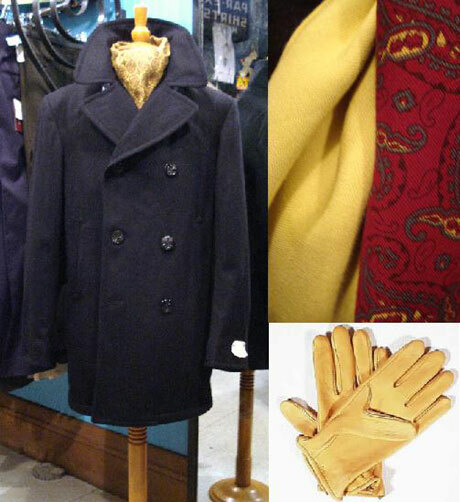 Curiously, despite the welcome revival of American work wear as a trend, these gloves have been largely ignored. To me they’re as iconic a piece of American apparel as Bass Weejuns, button-down oxford shirts, Redwing boots or chinos. I can’t imagine Clint Eastwood without a pair –whether or not he actually wore them in any of his movies I don’t know. 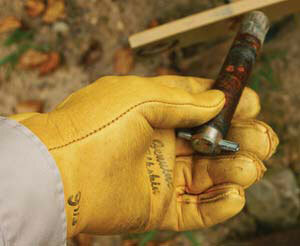 And other than a medieval gauntlet you’d be hard pressed to find a tougher and manlier glove. Normally made of Deer Skin or even harder wearing Elk skin, they’re the perfect combination of form and function, designed for roping in cattle and laying out barbed wire on cold windswept prairies. Over time to patina changes, and they will become grubbier, which only ads character –rather like beaten up suede loafer. 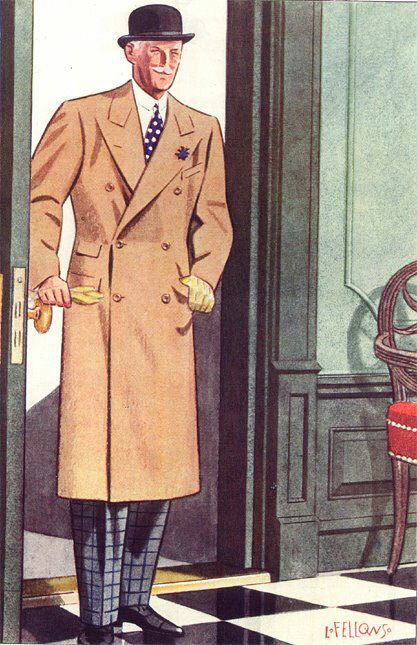 There is also a curious resonance with gentleman’s apparel of the 20’s and 30’s. The colour alone is very reminiscent of those gloves often featured in Apparel Arts illustrations. With that in mind I’d wear them with anything from a Peacoat to traditional Covert coat. Not only are they unavailable in the UK , it took me a fair amount of time to find out their proper name. I have found an English glove maker that will knock up a pair, at a reasonable price and of Deer skin. Somehow that seems just plain wrong, like going to Euro-Disney. You feel sullied, deceitful even; it’s just not the full Uncle Sam. After 2 years of longing I still haven’t managed to get hold of pair. So those of you in a more advantageous position than I, enjoy what you have. Thank you gents. Both useful suggestions.The Sierra Trading Post ones come closest. I may well bag a pair -although postage cost more then the gloves. However, the ones I’m really after are the Yellowstone company’s. Made in the US and, according to the articles I’ve linked to in my column, a very very close fit. But thank you again chaps, very kind of you to seek them out, and jolly useful. Simple solution, just go to one of the styleforum or askandy forums and post a proxy request for someone to ship them to you. That’s what I had to do for a pair of cufflinks that caught my eye at Moss Bros. While most of their stuff is probably inferior hire stuff, they could still do wise to offer shipping and purchase to US buyers. You’d think they’d get a clue after being near bankrupt to reach out to all market locations. I’ve got the glove bug as well, and have ordered a hand traced pair of chamois from chester jefferirs. We’ll see how they turn out. Only other place was Budd at about $90, but didn’t have my size, and required me to order 5 pair just to get it! I’m a farmer from the North West U.S. who likes style. But I have to tell you as much as I like my work gloves for bucking hay, they aren’t going to fit into high style. Just like you don’t wear your mud covered Carharts with a sports jacket. You don’t wear honest work gloves with a suit. They really aren’t that much different from dress gloves. Maybe a little thicker material, but they look pretty refined since the seams are inside-facing.